On Saturday 25th April 2015 the Quorn & Woodhouse station was the venue for the ‘Bus & Rail Event’ organised by the Leicester Transport Heritage Trust (LTHT) in association with the Great Central Railway. It brought together some of the excellently preserved former Leicester City Transport buses owned by the LTHT as well as a number of superbly preserved buses representing bus companies associated with the Leicester area in the past. This video programme concentrates on the buses that ran in Leicester in the past, and later shows the current scene as at April 2015. Our journey begins early in the morning at the Quorn & Woodhouse station where we see a line up of Leicester City Transport buses and the arrival of some of the visiting buses and coaches from fleets such as Mansfield & District, Barton, Confidence, Midland Red and Trent. 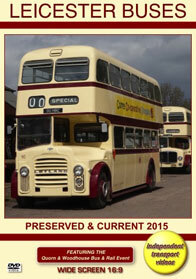 Our first journey from the station is on board Leicester 90 (90 HBC), a Leyland PD3A/1 with East Lancs H74F bodywork. The route takes us to Loughborough, calling at Loughborough Midland Railway Station and the GCR Loughborough Central Station. On arrival at the Midland Station we change vehicles and return to Quorn & Woodhouse on board Leicester 154 (FJF 193), an all Leyland PD2/1 in the maroon and cream livery used by the company until 1961, when the mostly cream livery was introduced. From the oldest Leicester bus on the day, to the most recent vehicle in preservation attending from the Leicester fleet, we join 50 (TBC 50X), a Dennis Dominator DDA142 with East Lancs H76F bodywork. It is also operating a duty to the two Loughborough stations, and we are in the company of former Barton 851 (851 FNN), a Northern Counties low height AEC Regent V making an interesting comparison. Back at Quorn & Woodhouse station we take a short break from the buses as we see Hall class 6960 ‘Raveningham Hall’ passing through the station, bringing back many memories of steam locomotives. This locomotive is on loan from the West Somerset Railway. Returning to the buses we now board East Lancs bodied AEC Renown 190 (DBC 190C), from 1965 for the journey to the Loughborough stations and back. Yet another style of bus from the Leicester fleet with the distinctive sound of the AEC engine that can easily be heard as we travel on both saloons to bring back the memories! Our final journey of the day is aboard 225 (ARY 225K) a single deck Metro-Scania BR111MH seating 44 plus 19 standing. This is operating the Charnwood Forest Circular Tour, taking in the lovely countryside and villages that surround Quorn & Woodhouse. The perfect end to a perfect day! For the second part of our programme we visit Leicester city centre in April 2015 and record the current bus scene. With locations including Charles Street, Humberstone Gate, Haymarket and Causeway Lane we see a good selection of the buses running the former Leicester City Transport and Midland Red services, now in the hands of Firstbus and Arriva. There are new Enviro 400 double deckers in both fleets, as well as a number of Arriva refurbished Volvo B7TL/Wrights now carrying Sapphire branding. First are still running a number of ALX400s in the old livery, but as you will see, the new shades are starting to appear! We hope you enjoy this variety of Leicester buses. Duration : 81 minutes (approx).